On March 10th I launched my second Tweetinar, “Social Media – The BIG Picture” based on Part Three of my book. This “Tweetinar” delivered social media insights three times a day, five days a week at 10:00 AM, 12:00 PM, and 2:00 PM, Monday through Friday, and runs all the way through SEPTEMBER!If you missed any of my first Tweetinar I will share those social media insights with you in each of two, bloginars. The sixth and final social media insights for this Bloginar. Be sure to RSS this blog or check back soon for the final 60 tweets to complete your Five Steps To Social Media Success bloginar. Also remember to follow my tweets for more social media insights and the biggest Tweetinar yet! • Millenniums do understand technology so work together in a partnership. • If you have the budget and find a good marketing / PR firm, outsource. • Often your time is better spent on what you do best. • Step 5: Implementation. Implement and measure. You can’t manage what you don’t measure. • If you’re doing video, use YouTube and TubeMogul analytics. • If it’s your web site, use Google Analytics or your server web reports. • If it’s blogging use WordPress and Google analytics. 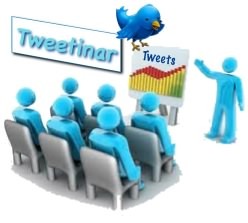 • Set up blog or web pages specifically as landing pages to test your Tweet effectiveness. • Use SocialMention and if you have the budget, use Radian6. • Try to Google’ing “links: www.YourDomain.com” to see external links coming to your site. • You Tweet, you add a Bit.ly URL, you wait 24 hours, you check the analytics for that page – ROI. • You see that 4 people from company X visited your page, you call your contact at company X. • You see how long they spent on your site, what pages they looked at, and what time they looked at it! • It’s time for a phone call to your prospect. • The new media isn’t like the old. You don’t throw a lot of money at it an hope for the best. • The new media can be measured in great detail, if you plan for it. • Even with the new media, you still need to manage your expectations. • All successful marketing takes time. Look at Ford, or McDonald’s, EVERY night. • Repetition builds brand & trust. You won’t jump up at 8:30 at night to buy a truck. • When you are ready to buy a truck, you will remember that Ford commercial. • Social media allows you to repetitively expose your brand to your prospects for free. • You’re not just reaching a newspaper sized demographic, you’re reaching the world. • Instead of hitting maybe 20k or 50k, you could hit 100k or even 1m but it takes time. • Manage your expectations and the expectations of the corner office. • To keep my perspective: The problem with overnight success is the 2 decades it takes to get there. • You can measure your tweets, your followers, your reTweets, your blog comments, your page hits. • When it working, keep doing THAT. When it’s not, then stop doing THAT. • Maybe change your conversion strategy, your type of content, your frequency, your persona. • Most importantly; Lather, Rinse, & Repeat! • Do something, measure it, change it up, and do it again. • To measure use: Tweetdeck, Search.Twitter, SpyFu, SocialMention, Google Alerts, YouTube Analytics. • Remember social media is like attending a social event. Step up, listen, then participate.